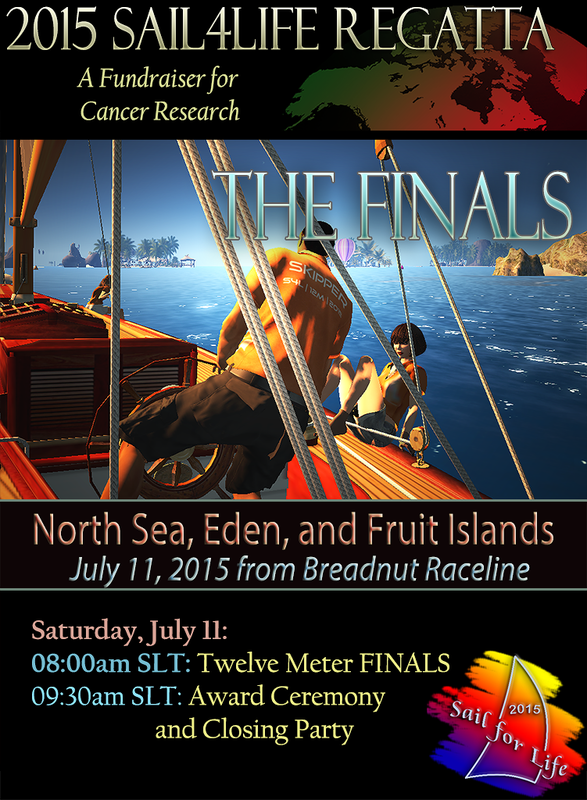 The S4L 12M Qualifying Races on June 20 were a real thrill, with 16 seasoned SL teams battling it out to earn a spot in the annual Sail4Life Regatta FINALS. After 12 hours of competition only four teams remained afloat. This quintessential quartet will now go on to race in a FINALS event on July 11 in North Sea. The next stop will be the FINALS shootout in North SEA!! Nber Medici is hosting a Raft-Up Party this weekend in the middle of Blake Sea to benefit the Sail For Life cancer fundraiser! The Third Annual Raft-up is here again, almost to the day! Tons of all sorts of boats! Multiple Goings on – you name it! G Winz will be in the middle of it all, spinning tunes! a number of folks, including yours truly! I’ll see you all there with drink in hand! for a truly epic raft-up party. excellent music, and one huge floating party!!!! See you all in Blake on Sunday! The S4L Twelve Meter Regatta is less than two weeks away! Many great SL sailors have already clambered onboard to compete, but we still have have two or three racing slots left. Sign up here to join us to race, to have fun, and to support Cancer Research! If you join the regatta, wondrous things will happen: you’ll get a free Trudeau 12 Meter Raceboat plus optional sail and hull textures by Diamond Marchant and J Trudeau. If you talk to Jane Fossett (that’s me), you’ll also get Offshore Racing Gear courtesy of Jane and Surfwidow Beaumont! But most important… if you join the S4L 12M Regatta you’ll help drive the SLSailing’s RFL campaign to fund cancer research, and that’s no small deal. Cancer is a brutal, relentless disease that’s been around since the dinosaurs. Basic science now has the tools to work out the fundamental pathophysiology of many common tumors however, and it looks like the finish line is finally in sight. If we join together world-wide, maybe we can find the necessary resources to stamp this dread disease out, once and for all. But more on that later; I need to talk about the Regatta! 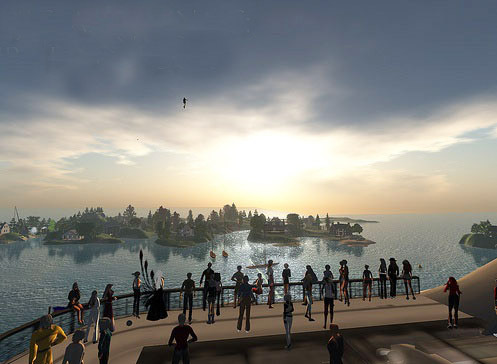 Racers, staff, supporters, and spectators should all join the 2015 S4L 12M REGATTA group in Second Life ( URI= secondlife:///app/group/8f139750-7e6a-038f-2d5d-2c51f6cbdd26/about). We’ll post updates and then do play-by-play in chat for all the race action in North Sea the weekend of June 20-21. For all Race Teams, please note I’ve opened threads on SLSailing.co and VirtualWorldSailing that include the Regatta Rules and all updated info. You can find details there on the Qualifying Races, including the chart and wind conditions! Sailors who have questions or concerns might find it easiest to post their issues there for all to see and respond to. I have much more to say about the boat, S4L, and omg the wonderful donors to this regatta, but maybe that will wait until next time! Relay for Life (RFL) is Second Life’s major charity fundraiser. RFL supports cancer research, and sailors play an important role through SAIL4LIFE, the RFL team that unites sailors grid-wide in this important endeavor. So, please, get up off your collective butts and join me in a rousing mega-shoutout for Winnie Sweetwater! Winnie is the Chair of SAIL4LIFE again this year, and wow, she’s done a great job! With the support of her stellar S4L 2015 team, Winnie’s organized a remarkably fantastic program of events this spring to support S4L! So forget all the Prozac! This is what you really want! 🙂 Let’s SAIL! Regatta Sail teams are going to compete aboard the new Trudeau 12 meter racer in qualifying trials on Saturday, June 20. To accommodate sailors worldwide, the Saturday races will be split into four different timeslot events that host four boats each. Woots! In fact, overall I think the combo of staffing, location, a cutting-edge boat, and hands-on support could truly make this regatta the ultimate ‘be-there‘ sail-race event of 2015! Go to the ENTRY FORM and sign up! You’ll see all the details there. This is a Team Race, and each team entry is asked to pledge $L5,000 to support S4L as the entry fee. The team can make that donation later, any time prior to the race, in any kiosk. Each team that signs up will receive a FREE 12 METER YACHT courtesy of Jacqueline Trudeau. 🙂 That covers your entry fee right there! Anyways, joining-up is as simple as that! I’ll post links to discussion threads and in-world support groups for the regatta very soon, to make sure everyone can get involved! Once again I’d like to give a big shout-out to the Leeward Cruise group. LCC is by far the oldest and largest active sailing group in all Second Life, and I’d wager it’s the most fun too. Chaos Mandelbrot and Kittensusie Lander are the sailors in charge of this ongoing major regatta, and each week they get tons of support from a growing group of appreciative skippers. This Tuesday (March 3) Chaos Mandelbrot’s LCC fleet will do it all again. The fleet will collect on the docks of Seychelles Isles Yacht Club in Glacis Isle. The club is in a full sim, so skippers can rez boats with ease, and accommodate a large, rowdy crew. 🙂 The fleet will take off at 5:00pm SLT sharp, so get there early! (What? you don’t have a boat? That’s the course for the March 3 cruise, above. The fleet will sail South along the Eastern shore of Nautilus, then take a turn around the Fastnet Light Memorial in the center of Blake Sea. They’ll next tack South and West to skirt Nautilus City, finally turning North through Brenda’s Channel. From that point it’s a straight shot up to Knaptrackicon and Danshire Yacht Club, the gateway to Dire Strait. Once you reach Knaptrackicon, make landfall on any of the docks there. You’ll then easily know where to go. Just look for the after-sail crowd already dancing to BennyThe Boozehound‘s music stream! This past November we observed the 50th anniversary of the assassination of John F. Kennedy, the 35th president of the United States. A half-century ago, Kennedy’s administration was often termed “Camelot.” That nickname referred to JFK’s lofty aspirations for change, but it also stood for the dream team he recruited to Washington to help achieve his goals. (In contrast, it may be worth noting that the nickname for George W. Bush’s executive team was… “The Vulcans.”). In any event, JFK’s aspirations for a new global understanding in the early 1960’s came to an abrupt and violent end by an assassin’s bullet on November 22 1963. Since that time the image of JFK’s unfulfilled potential has grown to legendary myth, and today JFK remains an icon of a distant, pivotal decade. Our present, collective view of JFK is certainly clouded by time. Nonetheless, one theme resonates true for me, since it speaks much to JFK’s character: The 35th president was a life-long, serious sailor. JFK fell in love with his Victura ‘knock‘ and he kept it close in the family. Years later Victura was the boat he used to teach his wife and children to sail. In fact, Victura still lives today. If you ever make it to Boston, Victura is up dry-docked and safe in a boat frame at the JFK Library. The wooden mast is stepped and the boat is fully rigged, waiting to launch. JFK and Khrushchev were on opposite sides of the world physically and philosophically, but they were able to reach a joint consensus in the midst of crisis. They stepped back from the widening abyss that emerged before them. Fifty years after that apocalyptic moment, many are now commenting on these past events, and honoring JFK’s legacy. Pundits keep trying to distill in prose the special qualities that defined JFK’s greatness and leadership. For me, it’s not that hard. After all, JFK was a sailor. 🙂 Sailors are used to responsibility at the helm, and they know the need for courage and clear thinking in the face of stormy seas. JFK’s personal doodles perhaps reveal how important sailing was to him. Sailing was more than a physical challenge; it was also a guiding metaphor for his life. Take a look at the thoughtless sketch in the figure above-right. Kennedy scribbled the note while in conference during the nuclear crisis in 1962. At the bottom of the drawing, JFK included a picture of his knockabout, Victura. To me, the sketch shows Kennedy’s animus at the helm as he tries to beat windward through a sea of truly horrific obstructions. The Victura sails well in gentle breezes and stormy seas, and it meant so much to the President and Bob to have you there. As we all know, John F. Kennedy was assassinated by a sniper’s bullet in Dallas, TX on November 22 1963, a year after the Cuban crisis. The night before his collision with history in the city of Dallas, JFK landed in Houston. Kennedy slept at the Rice Hotel, and left early the next day for the short plane flight to Dallas. The hotel staff discovered another doodle that JFK absentmindedly left on his bedside night-table. That last pencil sketch was a again a small sloop; some think the sloop is Victura. I’m not so sure on that point, though; the drawing lacks sufficient detail to tell. However it hardly matters, since the doodle clearly show2s that JFK’s last thoughts were once again focused on sailing. Kennedy faced a difficult reelection campaign that year, and he was en-route to tour a contentious state that held many electoral votes. It’s therefore perhaps no surprise JFK took a personal moment to inhale strength from his experience as a sailor. JFK was the U.S. captain, and all the responsibility rested on his shoulders. In a short, highly contentious interval of history, he was one of the rare few with the knowledge and experience to confidently take his nation’s helm. He was a sailor; that’s what sailors do. It’s no surprise the U.S. Intercollegiate Offshore Big-Boat trophy became the John F. Kennedy cup in 1965. I guess it’s also appropriate that Fair Harvard sailed to win the first Kennedy Cup, and that NAVY won the second. Since then, however, it’s all been up for grabs, and Cal Maritime is the recent offshore powerhouse team!